Happy Monday, everyone! Hope you all had a wonderful weekend. I finally saw Despicable Me on Saturday…and I LOVED it!! It was one of the first movies in quite a long time that actually made me laugh out loud. Highly recommend you check it out if you haven’t already. Well, I have one delicious recipe for you. I’m still learning how to cook salmon and mixing with flavors…and I tried this recipe last week and it has become a new staple. It’s light and flavorful and a great way to introduce people to this delicious and healthy fish. Preheat a medium skillet over medium heat with 2 tablespoons of the olive oil (twice around the pan). Add the onions, garlic, cumin, salt and pepper. Cook, stirring occasionally, for 3 minutes. Remove the skillet from the heat and add the juice of the second lime and the cilantro. 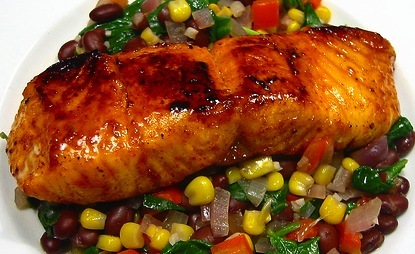 Serve the lime-and-honey-glazed salmon on top of the warm black bean and corn salad.